Figure 4-19. - Two styles of rubber dam punches. tooth, a rubber dam clamp is used. These clamps are made of spring steel in various sizes (fig. 4-20) to fit the general contours of the different teeth. 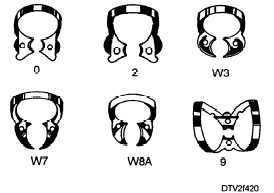 You will need to know some of the commonly used clamps and their area of use, which are shown in table 4-1. Clamps commonly used in pediatric dentistry include the #2, #4, #8A, and #14A. Clamps with "W" prefixes, such as the #W8A or W3, indicate that the clamps are without wings on the outer portions opposite the holes. Figure 4-20. - Rubber dam clamps. The space between the gripping edges of the clamp is narrower than the diameter of the corresponding tooth. Thus, to place the clamp around the tooth, it is necessary to spread the gripping edges wider than the tooth's diameter. 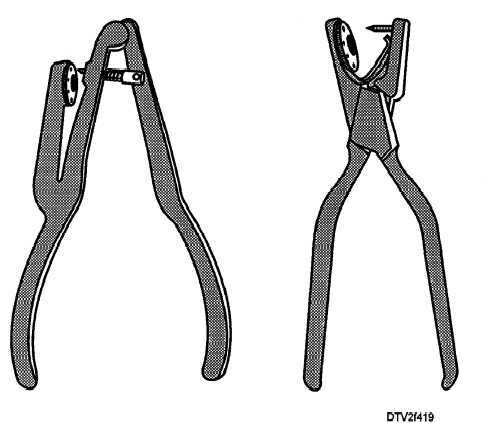 To spread the gripping edges, rubber dam clamp forceps are used.